Born in Butte, Montana, Alex graduated from Stanford University with a Bachelor of Science in Industrial Engineering via Salt Lake City where he attended high school and developed his love of skiing. He earned his Bachelor of Laws (Order of the Coif and Law Review Editor) at the University of California, Boalt Hall school of Law, Berkeley. Following law school he studied Indian Constitutional Law at the University of Bombay, India and was a law clerk for California Supreme Court Justice Raymond E. Peters. Forty years after his graduation from Boalt Hall, Alex received his Master of Laws from the University of Virginia, School of Law, rekindling his interest in constitutional law. Alex was the founding partner of the law firm formerly known as McDonald, Hecht and Solberg. Considered by those at the firm as an example of what is good in the legal profession, Alex practiced law for more than 30 years before he was appointed to the Appellate Court. He specialized in real estate law and was instrumental in notable real estate projects in San Diego, including the Meridian condominiums downtown, anchor buildings in the Golden Triangle, and the development of Rancho Bernardo. 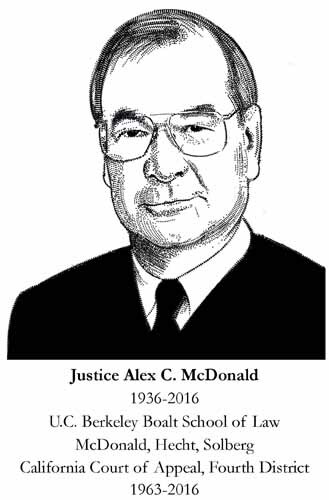 Alex served as a well-respected member of the California Court of Appeal, Fourth Appellate District, Division One for 21 years. He was married to his wife Judy for 56 years, and together they have four daughters, Katy, Ann, Margie and Liz, three sons-in-law, and seven grandchildren. The McDonalds have been long-standing residents of Kensington, living in their family home for 46 years.